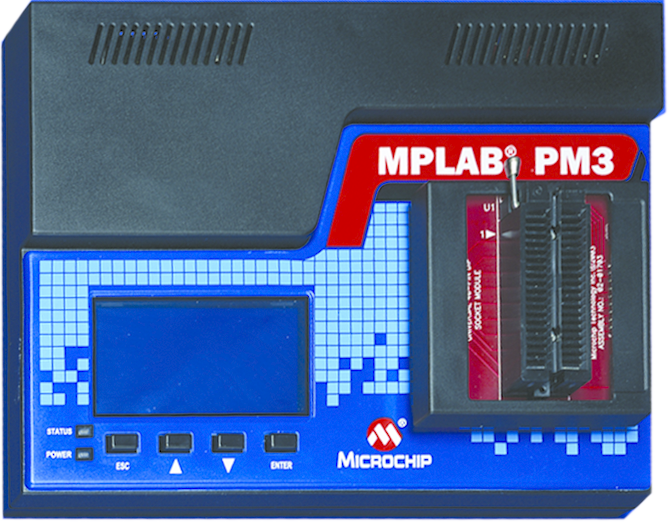 The MPLAB® PM3 Universal Device Programmer is easy to use and operates with a PC or as a stand-alone unit. Program Microchip's entire line of PIC® devices as well as the latest dsPIC® DSC devices. When used standalone, data can be loaded and saved with the SD/MMC card (not included). The MPLAB PM3 connects to a PC using either a high-speed USB 2.0 (shown below) or a serial RS-232 interface. Device-specific socket modules are available for inserting your device into the programmer.